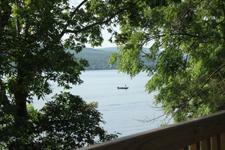 Until last week, fishing in the Finger Lakes was a foreign concept to me. In fact, fishing anywhere was pretty much a mystery to me. Growing up in the suburbs of Rochester, the closest I got to fishing was picking out what I wanted to eat from the seafood section of Wegmans! But, what I have realized recently is that fishing is a big deal in Ontario County. We have five lakes, the Canandaigua Outlet, an abundance of stream fishing and even ice fishing on some of the smaller lakes during the colder months. And if fishing is as big of a deal as I think it is, I must become more familiar with it! So, a few weeks ago I called a friend of Finger Lakes Visitors Connection to see if he could introduce our staff to the world of fishing in the Finger Lakes. Chris Kenyon is an avid outdoorsman and columnist for the Finger Lakes Times, and if anyone could point us in the right direction for an exceptional Finger Lakes fishing excursion, it was most definitely going to be Chris. 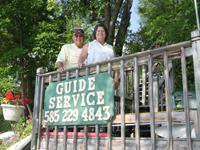 Chris hooked us up with Frank and Melody Tennity of Tennity’s Guide Service & Fishing Charters in Honeoye. After a few phone conversations with the Tennitys about how many people can fit in a boat, where we can get fishing licenses (Walmart is great for this by the way), and what someone actually wears to go fishing, we set up our fishing expedition with Chris and the Tennitys on Honeoye Lake. Our staff arrived at the Tennitys on a beautiful Thursday morning in late June and I am not sure there could have been a more peaceful place in the entire universe at that time. Honeoye Lake was crystal clear, the sun was shining and the sound of the wind rushing through the trees could lull even the most rambunctious soul to tranquility! When I thought about what makes a perfect day for fishing, this was most certainly it! We spent about an hour talking to Chris, Frank and Melody about fishing in the Finger Lakes, and you could just sense the passion they had for their craft. We talked about all the wonderful species of fish found in the Finger Lakes, the differences between boat fishing and fishing from the shore, what fly fishing was, and how a visitor to the Finger Lakes can have their own, unforgettable fishing experience by using a guide service like the Tennitys. The Tennitys also helped us understand fishing terms like jigging, casting, and trolling. (I feel like I can speak the lingo now!) 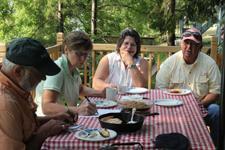 I can’t help but mention Melody Tennity also prepared a delectable apple cake and coffee cake for us… YUM! That was a special treat just for us, but Frank and Melody do offer fishing experiences that include dinner, and if her breakfast creations were any indication of what dinner could be, that is something not to be missed! After our discussion and breakfast, we headed out on Honeoye Lake to give this whole fishing thing a shot! 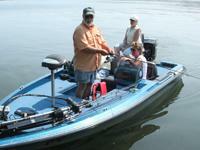 We boarded Frank’s beautiful bass boat and ventured out to one of his favorite spots. He gave us a few pointers, provided fishing poles and we started to cast out. What an amazing experience it was just sitting in the boat as it was swaying back and forth while waiting for a fish to bite. Unfortunately for me and a few other co-workers, no matter how hard we tried we couldn’t seem to catch anything! Sue and Sara from our office didn’t have that problem and both caught two fish each. Lucky for the fish, they were all returned safely to the water. The Tennitys have a strict catch and release policy they like to abide by. After a few hours of fishing, we all returned to the shore to have lunch with Chris and the Tennitys at Trident Marina Bucks Landing Restaurant on Honeoye Lake. It was a nice lunch with fantastic company and conversation. It was a pleasure spending the day with Chris, Melody and Frank. They showed us that even if you’ve never cast a line before, fishing is something that is easy to get started with and something everyone can enjoy. 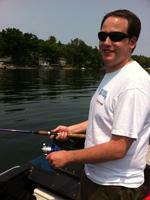 I look forward to getting out on the boat again soon so I can finally catch my first fish! If you are interested in fishing in the Finger Lakes, the Tennitys offer experiences on Honeoye, Canadice, Conesus, Keuka, Silver, Canandaigua, and Seneca Lakes as well as on Sodus Bay. For rates and more information visit www.mudlines.com or call Frank and Melody at 585-229-4843.